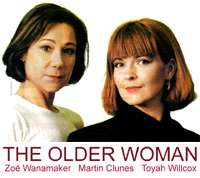 The first series of The Older Woman, the six-part radio drama which was originally broadcast in 1993, begins airing again on BBC Radio 4 Extra from today. Episode 1 of 6. Local hack journalist Roy Hitchcock meets his former English teacher, and sets out on a crusade to win her heart against all odds. Stars Zoe Wanamaker, Martin Clunes and Toyah Willcox. From January 1993. The sixth episode of The Older Woman is now available to listen to at BBC iPlayer. It will remain online until early next Friday morning. This is the final epsiode of Series One. A second series was made and aired in 1994 on ‘BBC Radio 4′ but I’m pretty sure that Toyah, or her character, didn’t appear. • View all of Dreamscape’s recent news on The Older Woman. The fifth episode of The Older Woman is now available to listen to at BBC iPlayer. It will remain online until early next Friday morning. The final episode airs next Thursday morning/afternoon and very early Friday morning. The fourth episode of The Older Woman is now available to listen to at BBC iPlayer. It will remain online until early next Friday morning. Episode Five airs next Thursday morning/afternoon and very early Friday morning. 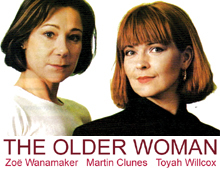 The third episode of The Older Woman is now available to listen to at BBC iPlayer. It will remain online until early next Friday morning. Episode Four airs next Thursday morning/afternoon and very early Friday morning. The second episode of The Older Woman is now available to listen to at BBC iPlayer. It will remain online until early next Friday morning. Episode Three airs next Thursday morning/afternoon and very early Friday morning. Thu 6th June: 7am & 5.30pm/Fri 7th June: 5.30am Episode 3 of 6. Roy’s quest to insinuate himself further into Jane’s good books gets a new lease of life when she requests his help to save a tree. Stars Zoe Wanamaker, Martin Clunes and Toyah Willcox. From January 1993. The first episode of The Older Woman is now available to listen to at BBC iPlayer. It will remain online until early next Friday morning. Episode Two airs next Thursday morning/afternoon and very early Friday morning. The six-part radio drama, The Older Woman, in which Toyah plays Elsa airs again from next week for the first time in many years on BBC Radio. Originally broadcast by ‘BBC Radio 4′ in January and February 1993 it also stars Zoë Wanamaker and Martin Clunes as Jane and Roy. It’s being repeated by BBC Radio 4 Extra. Toyah also sings the theme tune – Listen here.